After you get the VoIP provider account, you need to configure the account in MyPBX. 1. Go to PBX > Trunks > VoIP Trunk page and click Add VoIP Trunk. 3. Click Save button and Apply Changes. Go to Status > Line Status > Trunk Status to check if the Service Provider trunk is connected successfully. 1. Go to PBX > Outbound Call Control > Outbound Routes, click Add Outbound Route. 2. Configure the outbound route. Route Name: give the outbound route a name. Dial Patterns: set the dial patterns. As the settings below, to make calls via the Calllacloud SIP trunk, you need to precede the number to be dialed with the prefix 8. 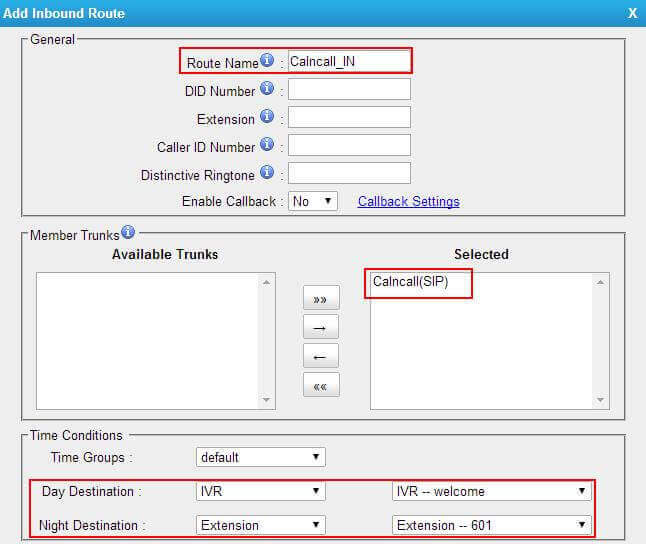 Member Extensions: select the extensions that are allowed to make calls through the outbound route. Member Trunks: select the Callacloud SIP trunk. 3. Click Save and Apply Changes. 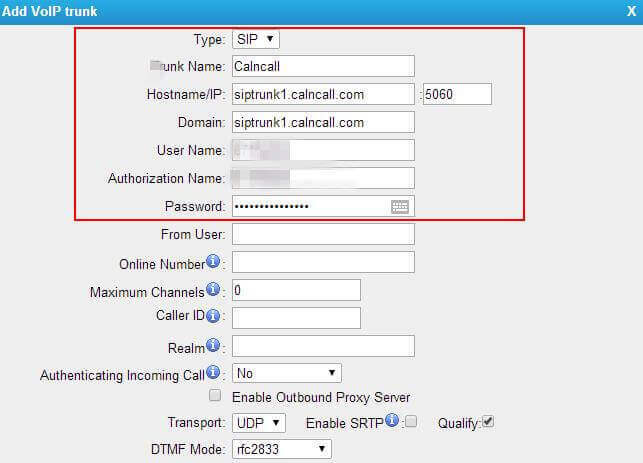 Now you can make outbound calls through the Callacloud SIP trunk. As the dial patterns configured above, you need dial digit 8 before the destination number. For example, to call the number 17373621819, you need to dial 817373621819 on your phone. 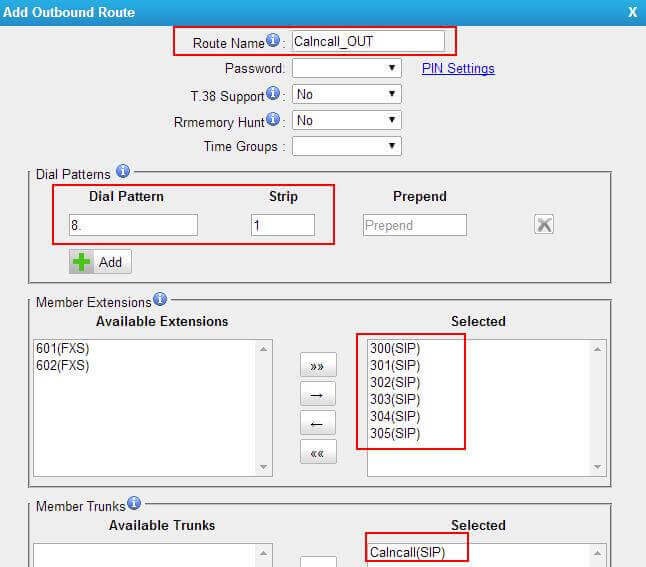 Specify how calls from the Callacloud SIP trunk should be routed. You need to configure an inbound route for the SIP trunk. 1. Go to PBX > Inbound Call Control > Inbound Routes, click Add Inbound Route. 2. Configure the inbound route. Route Name: give the inbound route a name. Member Trunks: choose the Callacloud SIP trunk. Day Destination: select the destination when the time matches the times defined in the Time Group, generally your office time. Night Destination: select the destination when the time does not match the times defined in the Time Group, generally your non-office time. 3. Click Save and Apply Changes. When you call in the SIP trunk, the call will be routed to the destination configured on the inbound route.